Woo, hoo! It's Sunday and time for another Paper Players challenge! This week the amazing Ann Schach has a One Layer card challenge for us. She rocked the last one! Though I love one layer cards, I tend to be a 'lots of layers' girl. So I fully anticipated having to make a few cards before I created one I was happy with. Much to my surprise I was pretty happy with the first one, which was inspired by a card I saw on Pinterest. This is card making in its purest form: just stamps, paper and ink. Don't look too closely as it is not a perfect creation, but I think I did pretty well considering I left the Stamp-a-ma-jig in its holster. Plus, if it was too perfect it would look like it was made in a factory. At least that's what I tell myself! There I go justifying again! 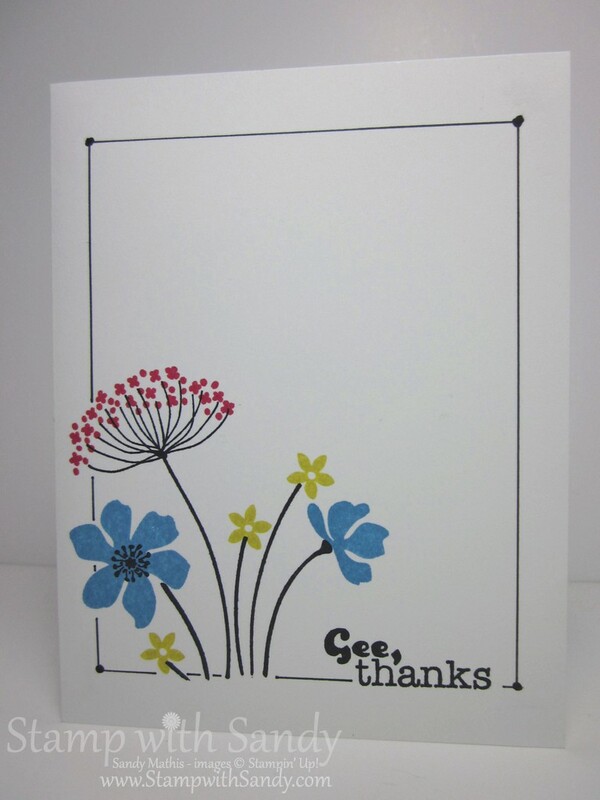 I've always wanted to do a card with a hand drawn outline. First I stamped my images and my greetings, with a little mask at the bottom so the stems all ended in sort of the same position. Then I measured in from each corner and made a little dot with a pencil. 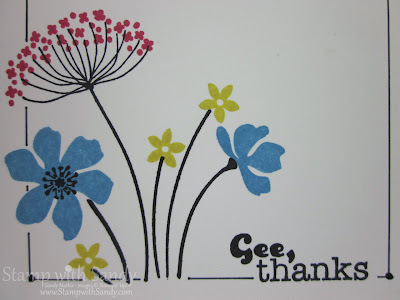 I connected the dots with a Stampin' Write Marker, then made a squiggly dot at each corner. Such fun! 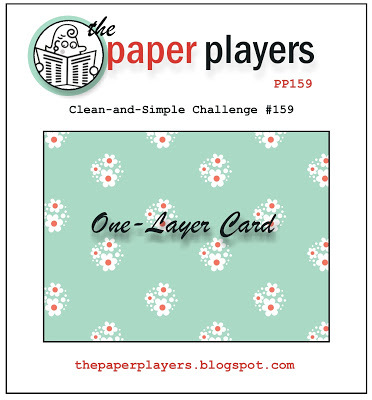 I hope you play along with this challenge at The Paper Players! I'm very excited to see what you all create! 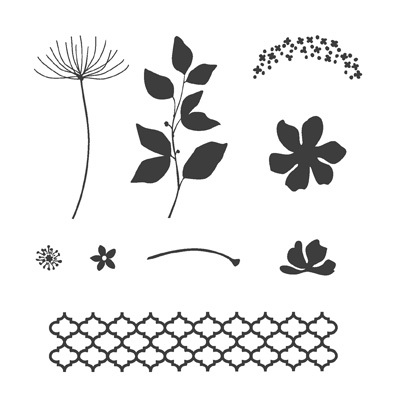 Come visit the rest of the Design Team for inspiration! Looks factory made to me! 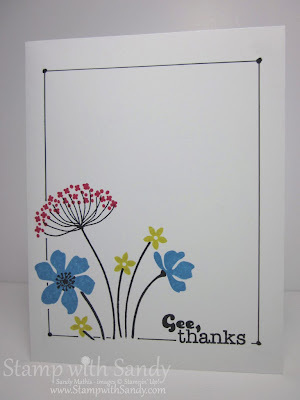 Love the bold look of this card from stamping the stems a sentiment in black. A gorgeous, modern card, Sandy. Yes, I am impressed you did this without a SAMJ too! You're a brave woman, and it turned it SO WELL!!! Love your hand-drawn border too....another brave feat! I particularly like your color choice...really makes the card pop! This is a brilliant CASlicious OLC, Sandy! 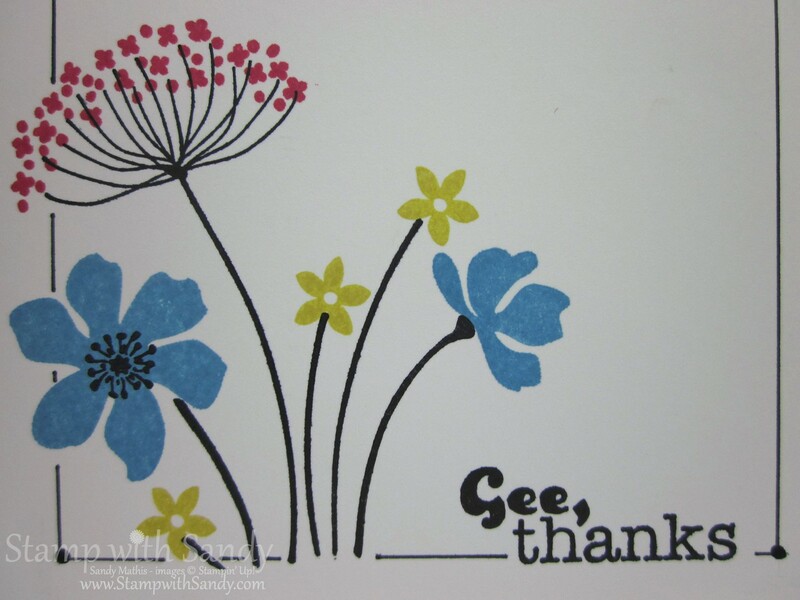 I love your frame which really makes those gorgeously colored flowers just pop!! So pretty!!! Love the clean simple lines. The border is a perfect touch to the images. Nice card.